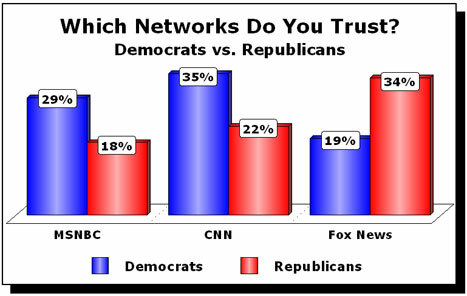 A major biennial news consumption survey from the Pew Research Center for the People and the Press released on August 17, 2008 found that 'virtually every news organization or program has seen its credibility marks decline' and 'Democrats continue to give most news organizations much higher credibility ratings than do Republicans.' In preparing the 130-page report on media credibility, Pew talked to 3,615 adults; the data are comparable to earlier Pew studies that followed the same methodology. In 1998, 42 percent said they could 'believe all or most' of what CNN reported; ten years later, that figure had dropped to 30 percent (though that was the highest of the news organizations polled). Fewer than one-fourth said they could 'believe all or most of what NBC News (24%), ABC News (24%) and CBS News (22%) report (based on those who can rate those organizations).' Less than one-fifth (18%) said they could 'believe all or most' of what they read in the New York Times.